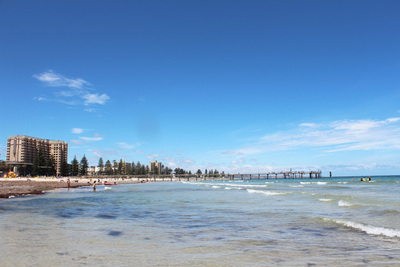 Glenelg is one of Adelaide's most popular beaches, while it's definitely not Adelaide's best beach it is a good family spot. Parking is a huge pain. You've either got paid parking, or you spend half your time hunting for a park, if you live anywhere near a tram stop, catch a tram instead. It's easier than a bus and you can still lug along your buggy, buckets, boogie boards, and beach bags, plus it stops at Moseley Square, right by the beach. We were on a mission to build a sandcastle, but couldn't find any buckets at home (the 4-year-old claims they're a sandcastle necessity). Instead we got off at the Jetty Road tramstop and popped into the reject shop where we grabbed a couple for $3. Jetty Road has a plethora of food shops, $2 shops, and pharmacies, which means you can generally pick up anything that you forget at home. 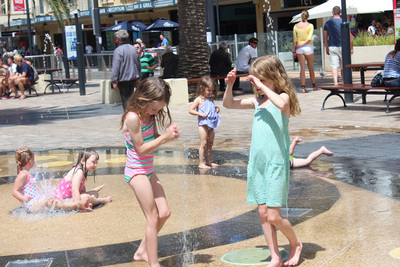 It's one of the reasons that Glenelg is such a convenient family beach. It can get busy, but the beach is so big that you can generally find your own spot. 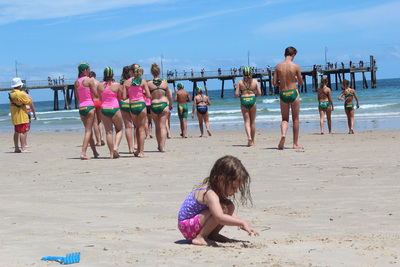 If you're with the kids try and get one near the lifeguards, that way it's easy to keep them swimming between the flags. Glenelg is usually a fairly calm beach, so you don't need to worry about epic waves ruining a simple swim. The water is nice and clear, and the sand is great as long as it's not covered in washed up seaweed. 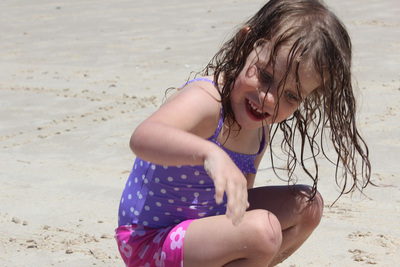 Of course a day at the beach usually consists of building sandcastles, swimming, and collecting seashells, but there's usually more on offer. Adelaide Ballzup are now running their beach zorbs, there are bungey trampolines on Moseley Square, volleyball nets, a jetty to explore, and you can even have pony rides sometimes. It's also hard to ignore the water slides at the Beachhouse that provide a backdrop to the beach. After the beach head up to the fountain on Moseley Square. Kids will have lots of fun playing in the water. There's food within easy reach. Grab fish & chips, ice cream, or pretty much anything else. You can even grab a spot on the grass to have a picnic. Just make sure you pack the sunscreen (or buy some) and you're guaranteed to have a great day out. 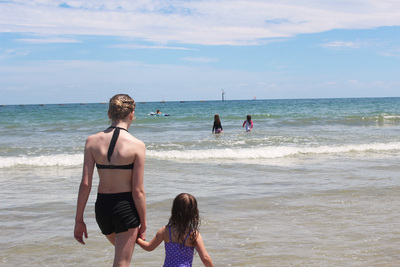 Is Glenelg Adelaide's best family beach? Or do you have another favourite?